Below - A photo taken in the park in the early 20th Century. 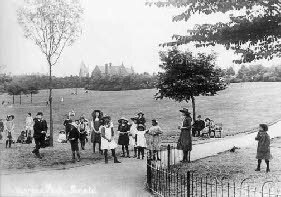 In 1894 the Fire Engine Farm in St George was purchased with the purpose of laying out the park and the paths were laid. A lake was built along with a bandstand, trees, and additional features were also added. 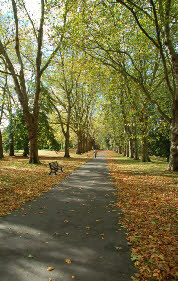 In 1897 the park became the responsibility of Bristol Council and by 1902 the splendid avenue of London Plane trees was installed. City of Bristol, and is popular with local residents and visitors . There is an active Friends of St George Park group. In 2017 a new raised floral bed was created in St George Park, and this was funded by the Tesco's Bags of Help grant that St. George in Bloom was awarded in 2017. This addition was designed by Trevor Ball, and was installed and planted with the additional voluntary support from some members of The Friends of St George Park group, and other local resident volunteers. In April 2018 a new fence was constructed and installed around this area to protect the plants. A gap in the fence has deliberately been left for ease of access, maintenance and further planting. Victor Sharp who are members of St George in Bloom, and was also funded by the Tesco's Bags of Help grant that St George in Bloom received. Many thanks to everyone for working on this fantastic project which greatly enhances our lovely local Victorian Park. The restoration of the original benches in the park. 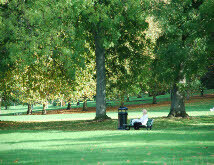 When you are relaxing and sitting on a bench in the park and enjoying the lovely vistas, spare a thought for the local residents who have given up their free time as volunteers to repair and restore the benches that are located there. The Rev Andrew Yell (Right) and Trevor Ball (Left) worked very hard to ensure that the benches were restored and repainted as part of a project called ' Bench Aid' a number of years ago.